Fig. 1. 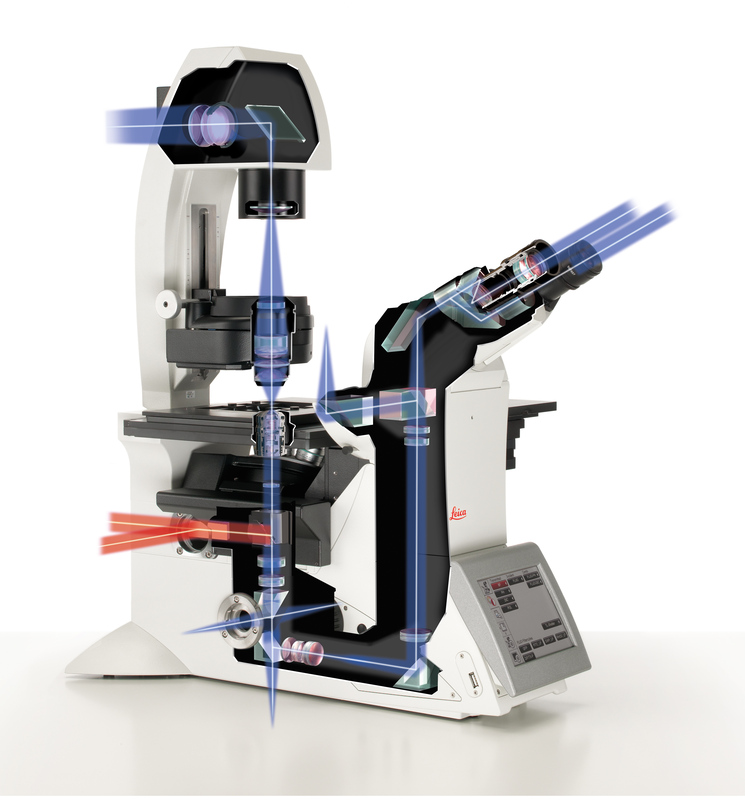 The Leica DMi8 features the Infinity Port (the red light path), enabling advanced microscopy applications. Fig. 2. 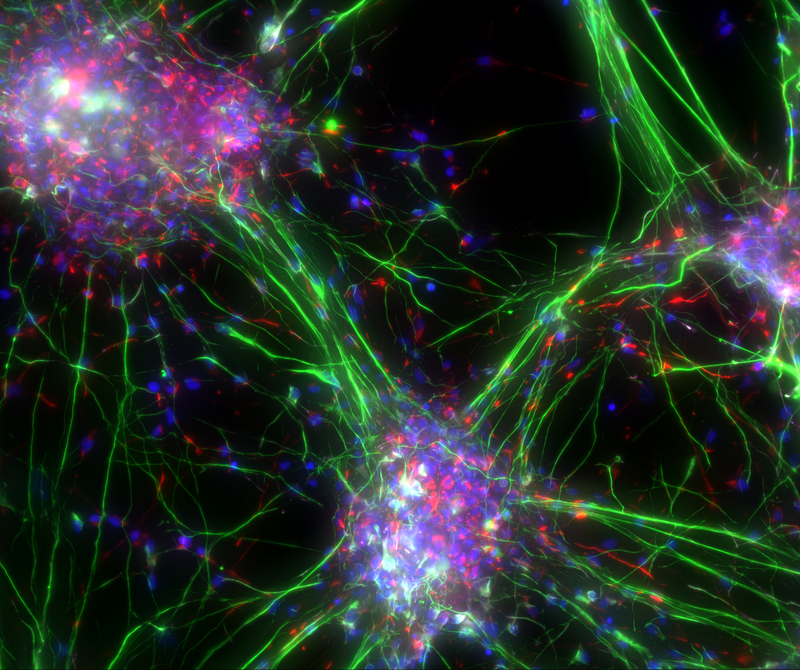 Neuronal cells visualised by immuno fluorescence microscopy: Nucleus (DAPI, blue); Tubulin (Cy3, green); Nestin (Cy5, red); DCX (Cy2, magenta). Dr Christoph Greb explains how the latest microscopy innovations are enabling greater flexibility for researchers. Research microscopy is a vivid and constantly evolving bioscience branch. Due to the high degree of innovation, the number of different applications grows continuously. This also means that users have diverse requirements when considering the purchase of a microscope. With this diversity, microscope manufacturers are required to change substantially. While preconfigured, closed microscope systems answer specific customer needs very well, an additional new idea has spread through the microscopic society: higher flexibility in microscope construction and configuration. Leica Microsystems took the variety of applications as well as the rise of microscope facilities and multi-user environments and – last, but not least – a growing community of homebuilders into account, and reacted with the new inverted research platform, the Leica DMi8. A number of innovations fulfil scientists’ wishes for more elasticity and openness. Firstly, a new modular design gives researchers the ability to only acquire the components they need. Thanks to this approach, it is possible to combine single features to set up an individually configured, inverted microscope system. With it, routine as well as high-end techniques can be performed, starting at simple documentation through to multidimensional imaging of living cells. One example is that motorised and manual devices such as filter wheels or focus drives can be combined freely to fulfil the users’ needs. A researcher primarily interested in 3D imaging could arrange a motorised focus drive into an otherwise manual system. In a similar vein, users interested in multiple-colour acquisition could start with a motorised filter wheel and a manual focus. The advantages of a modular microscope platform are reflected in more than just the acquisition phase. A modular system is also open for updates. If preferences change, the microscope can be upgraded at any time to face new challenges in biology. Besides the individuality (plus the option to upgrade it later on), this new type of inverted microscope offers another novelty. Modern research microscopes utilise infinity optics, delivering parallel light rays between the objective and the tube lens. Optic auxiliary brought into this infinite light path does not harm the image. The Leica DMi8 gives users access to the infinite light path via the Infinity Port, a sophisticated opening at the microscope stand (see Fig. 1). With this, a new world of opportunities opens up for scientists. On the one hand, third-party equipment such as fluorescence light sources and laser systems can be attached to the microscope; on the other hand, tinkerers can couple their own devices for any kind of application. Advanced techniques such as FRAP, photo-switching, ablation, optogenetics and many more can be conducted – with the same microscope stand. For flexible image acquisition, four different camera ports are available, which were optimised for sCMOS cameras. To cope with these newly established, large-format camera devices, the field of view measures 19mm compared to 16mm on standard camera ports. a programmable touchscreen help to save time and effort, especially in a multi-user environment. In addition to hardware, the microscope software is the second important pillar that contributes to a useful microscope system. Reliable imaging and analysis software arranges the integration of the hardware, for example third-party cameras. To improve comfort, hardware and software should interact seamlessly. In the end, users should be able to configure their own, custom-made microscope and enjoy the ease-of-use of a system solution at the same time. past, since the request for open microscopy platforms has grown stronger. With their help, scientists can build an imaging system specified to their experiment and not vice versa. The major breakthrough for open microscope solutions is the access to the infinite light path. The Infinity Port serves this development and gives researchers the opportunity to follow the new developments in optical microscopy. The demand to interact with and manipulate the specimen for example by FRAP, ablation or optogenetics can only be met comprehensively with this new class of inverted microscopes. Evidently, an open microscope platform allows for a constant adaption to new applications. Hence, such an instrument is also an investment for the future. Researchers will be able to follow the evolution of biology and technology with only one microscope stand. It will be exciting to observe new developments in cell biology based on these new opportunities.